We provide a variety of equipment to be used in our space, for example: Little Bits, Electric Bricks, building tools, Circuitry materials, LEGO, iPads, cameras, microphones, flexi-geo models, Goldie Blox, 3D pens, 3D printer and many craft materials. 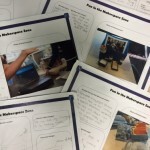 Design planning sheets are available for our girls to guide them in their making and to keep a record of their processes and it’s also a place to have photographs of their finished piece of work. These can then be shared in displays around the library. Within our Makerspace we have robotics where the girls can build LEGO WeDo, NXT Mindstorm and program BB8 droid and Parrot Minidrones. Using Scratch and the Tickle App our girls code the robots to follow their instructions and commands to move around the library. The Australian Digital Technologies Curriculum is being addressed in the varied activities taking place within our space. The projects meet a number of learning objectives including computational thinking and programming skills. Recently our girls started a Marble Run Wall demonstrating engineering skills as they problem solve how to creatively make interesting and challenging runs which are slow in parts and then speed up with steps, pinwheels and even LED lights! There has been a lot of interest in our 3D printer and 3D pen. As part of a Geography unit one student group designed and printed an artefact to illustrate their concept. The girls thoroughly enjoy making necklaces, bracelets and trinkets with the 3D pen. Another popular activity is wearable art. The girls use conductive thread, LED lights and press studs to make jewellery. The article can be found scrolling through the Huddle. 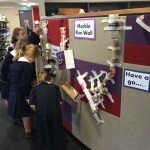 ‘STREAMS’ [ science, technology, reading/(w)riting, arts, maths and social]…… is very much alive and present in our Junior School Library Makerspace.